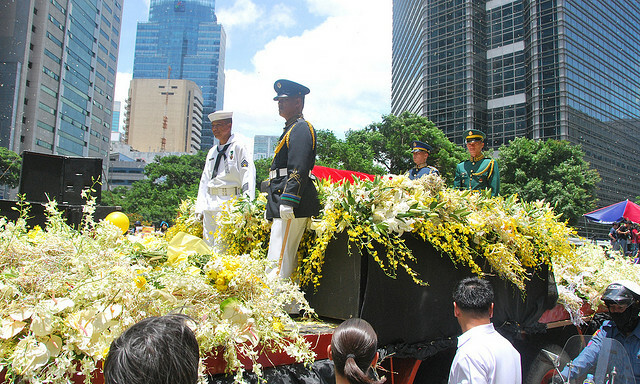 A country says goodbye to a much-loved former president. Your family – and by this, I don’t mean just the Cojuangcos and the Aquinos – has begun to move on. The wind has started ripping and blowing away all those homemade streamers, those yellow ribbons which were lovingly put up for you from way back in July until two weeks ago. And although bouquet-bearing people still offer bright yellow flowers of all sorts outside of your home or by your grave everyday, normal life has resumed for the rest of the country,. Which probably makes you happy, Mrs. Aquino, because I think you – in all your goodness – wouldn’t want this country to remain in mourning, albeit it was your passing which reunited us in the first place. After all, when you found out about Mr. Aquino‘s assassination, you chose to rise above yourself as you took on his cause and made sure that he didn’t die for naught. and how you just allowed us to wholeheartedly love you – for that was all we can really do. And I end up sleeping with a smile on my face and a wish in my heart, Mrs. Aquino: that the good Lord would give me the grace to live my private and lowly life as admirably as you had. When people think of me when I’m gone, it is my sincere prayer that they would remember me as one who simply lived and loved, and by doing so, inspired others to do likewise. The late Corazon Aquino was the first woman president of my home country, the Philippines. We all need to get a good tan every now and then, so click to subscribe to this blog and receive notifications of new posts by email.